We are a home schooling family of five living in an average size home which translates into us accumulating a lot of things. My husband becomes very uncomfortable with any clutter so I am always looking for creative storage ideas. I was immediately intrigued with the concept of the Neat Containers pod storage system and could not wait to try it out. The Neat Containers product system is 100% U.S. made and is perfect for organizing virtually anything including closets, kitchen pantries, school or craft supplies, dorm rooms, kid’s playrooms and more. What makes Neat Containers so unique and valuable is that it is “the only clear storage system that lets users remove and open individual pods from each stack without disturbing or collapsing nearby stacks or rows”. This really got my attention because my prior closet storage system did not allow me to access the bottom containers without removing everything sitting on top or around it. This easy-to-use closet organizer pod system can also be used as stackable shoe boxes or as a clear shoe storage system. 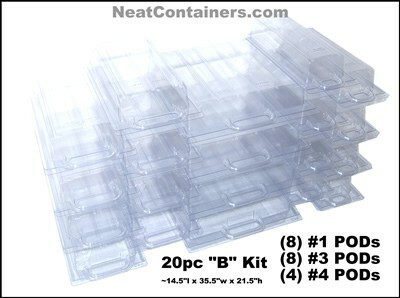 I received a Large Combo Kit ($49.99) from Neat Containers which includes a 20 piece assorted storage set. I like that this set includes various sizes that are suitable for example for storing a sweater, shoes and accessories. I decided to use this to organize my children’s closet and found that it is so versatile. When I find a really good shoe sale, I will buy children’s shoes in larger sizes and keep it stored in their closet until they need a new pair of shoes. This saves us a lot of money but it is a disaster in terms of organization because the shoes become a jumbled mess and it is hard to find the size that I need. The Neat Containers system is the perfect way to organize their new shoes and I can even label it with the shoe size to make identifying it even easier. It is also perfect for accessories like sunglasses, hair bows, socks etc. Once I determined how I was going to use my first set of Neat Containers pods, it was time to set up my system. I watched the helpful online tutorial and setting it up was a snap! Are you curious to see how it works? I am so impressed with my new storage system by Neat Containers that I am already brainstorming ways to use additional sets. In fact, it is the perfect way for me to organize our home school and craft supplies. The modular design makes it easy to use in virtually any space and the clear, durable plastic pods make it easy to see the contents. What really makes this product ideal for storage is that you really can remove any of the individual pods from anywhere in the stock and it is not going to collapse or cause other pods to fall…..it really does work as promised! I find that this storage system is very affordable and I like that you can save money by purchasing a combo pack and can then customize it to suit your needs by adding on or selecting additional sizes or kits. You are invited to visit the Neat Containers website to purchase your favorite kit package……getting organized was never this easy or fun! One lucky reader will receive a Small 20 Piece Combo Kit from Neat Containers….that is a $47.99 value! I would love try the Neo Pod kit. the containers do look sturdy, thanks for having this contest. I would like the 100 piece mega kit. the mega kit – love it! I like the mega kit. I could use it to organize my closet. I like the Closet Organizer Kit. I really need the Shoe Kit Starter Pack. I would love to get the shoe and boot kit to organize all of my shoes. The Shoe and Boot Kit (30pc) would help me out a lot. would love to try the shoe and boot kit! I think that the “Closet Organizer Kit – 52” would be a perfect set to start with! The 60 piece shoe kit would be great, I have SO many shoes that they’re over taking my clothes in my closet! I like the #1 POD 60pc Pack (60pc) Shoe Kit. The Neo pod kit is really cool. The NEO Pod Kit looks like it could be used for so many things. From Neat Containers, I would love to use their Mega Pod 10 Piece Package to help get some things organized in the basement and the garage. Thanks for the great review and for the giveaway opportunity. ~Pauline ([email protected]). I like the mega pods to help organize hats and clothes. Would love to try the shoe kits. The closet organizer kit! …a must! This would help us get more organized! The mega pods would be useful to me! I would love to have any of the closet-type organizers – shoe, sweater boxes, etc. My daughters simply CAN NOT stay organized! If the everyday items of clothing and shoes are “Neat Containered” – then I think I would have a fighting chance! I like the large combo kit. I like the ‘Sweater POD 12pc Add-on’…Thanks…. Oh I sure could use these!!!! My house is a mess! !